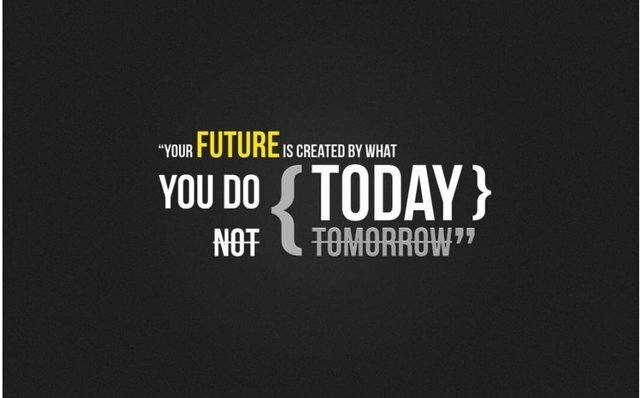 There is a saying: The best to prepare for tomorrow is to to do today's work properly. There have been so many instances in my life when I got very upset.And thought what to do next. And some solution also occured before me but I skipped bcoz of some reasons or laziness. It happens with everyone. People set their goals, make time tables but mostly they say let's start tomorrow. One of my friend is of 83 kg weight. One day he said I'm gonna loose my weight by joining gym and exercise from tomorrow.But after a while he said no tomorrow is sunday, I'll start from Monday. So what ever you wanna do start it now only.The greatest impact is when we think to do something.And if you delay bcoz of any reason you will not have the same jeal and enthusiasm. @panditsaurabh Thanks for motivating.This happenes with me most of the time,I make time table to do some task but I fail due to laziness or some other reason like Friends come to my room.But i will try to start from today itself. It happens with me too. But I always try to control my laziness. This post has received a 4.51 % upvote from @boomerang.